Employees’ duties change depending on the time of year and the weather. We work outside in the elements, doing a variety of jobs. The business changes from month to month, and sometimes from day to day. In the spring and early summer, we are very customer and sales centered. During that time, you must be available retail hours, including weekends and some evenings. We all work hard, but it is a labor of love, so it is more pleasurable than almost anything else you can do while getting paid. 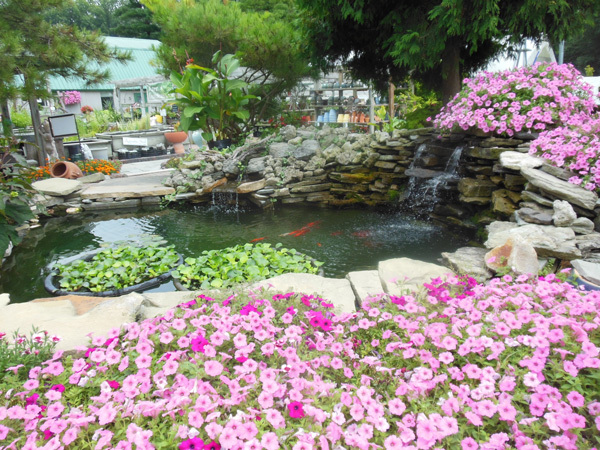 When people come to a garden center such as ours, they are coming to be inspired by our display areas, helped with their projects , and treated as friends. A mature work ethic, the desire to go the extra mile, and a fun-loving attitude are traits that Oak Parkers have and what we look for when making hiring decisions. ‘Quick and dirty’ landscape design is a service we offer free of charge to our retail customers. Landscape and water feature installations occur throughout the season. Learn real-life landscape design and installation while on the job. We service many commercial and residential lakes and large ponds in the area. The ability to follow directions and maintain safe work habits are essential to this job. It requires the ability to work outside in the elements, a valid driver’s license, lifting, and record keeping. One of the things we do best is water! From a freestanding fountain to Lake Erie, we help anyone with a water feature. We have an opening for someone to take control of seeing that our onsite features and our fish both in dis-plays and for sale are well cared for. Fill out the form below to apply for your desired position at Oak Park Land and Water Garden! How many hours are you able to work weekly? If yes If yes, explain number of convictions, nature of offense(s), how recently such offense was committed, sentence imposed and types of rehabilitation. Are there any skills, knowledge or traits we should be aware of when considering you for employment? By submitting this form I certify that the answers are true and complete to the best of my knowledge. If this application leads to employment, I understand false or misleading information in my application or interview may result in my release.